Every good beer week requires a great closing cask night. 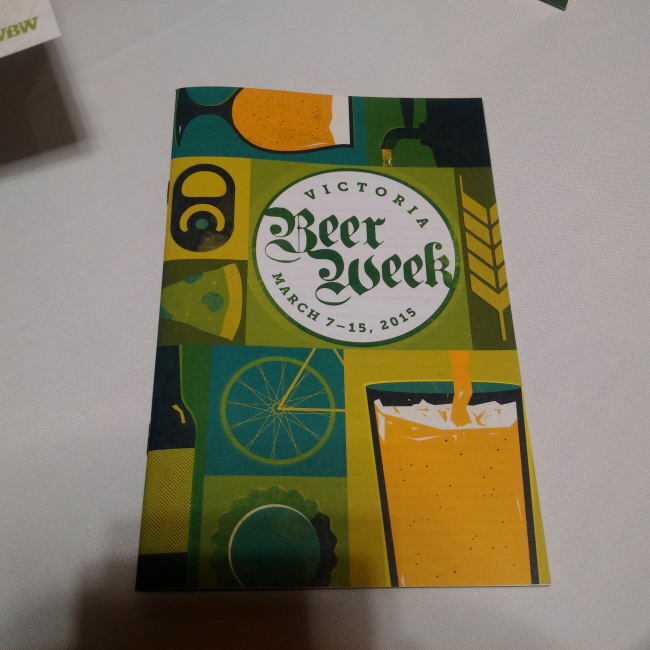 Victoria Beer Week 2015 was no different. On March 14th, 2015 the closing cask festival was held at the Victoria Public Market. While the opening cask festival centered on Victoria beers the closing cask festival centered on Vancouver and other parts of British Columbia. Being from Vancouver I was happy to see that most of the breweries on hand brought interesting one off casks not just standard fair. This event seemed to really have a buzz especially as many of the beer on sample were from breweries that are not easily attainable on the island. As I know one of the organizers I did not have to wait in line and was able to get a bit of an inside look into the setup of the event. Here are a few of the photos I took while behind the scenes. Once it got closer to the time that the doors would open I got a my grubby mitts on the list of beers that would be poured. 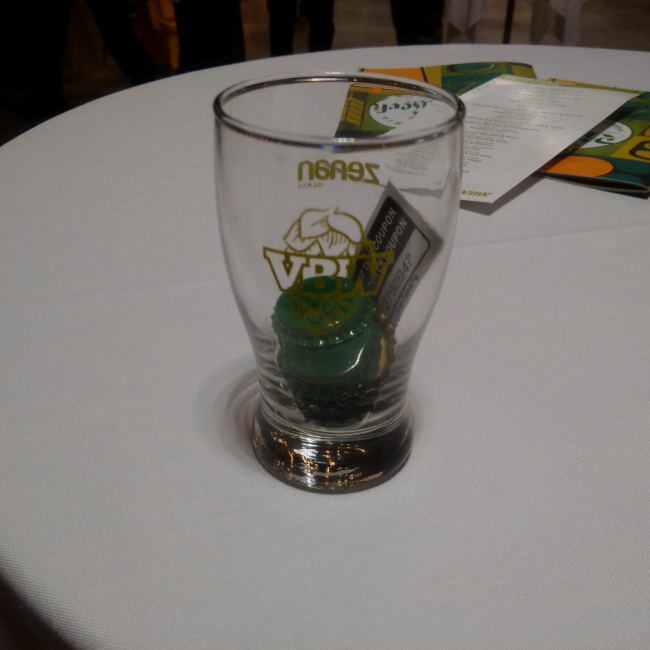 Once the doors were about to open I was able to get my glass that came with 8 drink bottle caps and one food ticket. More could be bought at 4 beer tokens for $5 and one food ticket for $5 both of witch you would need more as the beer and food were both great! Once the doors opened it was a steady stream of ticket holders, brewmasters and brewery owners. The event was very relaxed with little to no stupidity that can break out when you have alcohol involved. 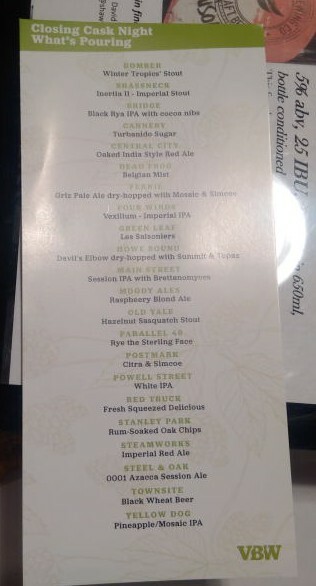 People were way to excited to try amazing beer to be causing any trouble from what I could tell! Overall the cask festival was an amazing event. I met all kinds of great people be it festival goers or VBW volunteers. For the Volunteers you know who you are thanks for being really friendly and chatty. I also never need a reason to chat with all of the brewery owners and brewmasters from the Vancouver region and I did a ton of this at this closing cask event. I have to say that Victoria seems to know how to hold a cask event to be sure! Being inside of the Victoria Public Market really gave a cool vibe to the event also. It is a really cool space that lends itself to large gatherings! This entry was posted in Beer Travel, Tasting Event and tagged 2015, bc, beer, beer week, bomber brewing, brassneck, bridge brewing, canada, cannery brewing, cask fest, cask festival, central city brewers & distillers, central city brewers and distillers, closing cask fest, closing cask festival, craft beer, dead frog brewery, fernie brewing, four winds brewing, green leaf brewing, Howe Sound Brewing, main street brewing, march, moody ales, old yale brewing, parallel 49 brewing, postmark brewing, Powell Street Craft Brewing, red racer brewing, red truck beer, stanley park brewery, steamworks brewing, steel & Oak Brewing, steel and oak brewing, strange fellows brewing, townsite brewing, vancouver island, vbw, victoria, victoria beer week, victoria public market, Yellow Dog Brewing.